Sciatica is actually a sign that you have an underlying problem putting pressure on a nerve in your lower back. The most common cause of this nerve compression is a bulging or herniated lumbar disc. Arthritic conditions can also cause sciatica. Disc degeneration (thinning of the disc) is also a common cause as is spinal stenosis (narrowing of the spinal column that causes pressure on the spinal cord). Dr. Peck utilizes x-rays, CT and MRI when indicated to determine the cause. Piriformis syndrome is another common cause of sciatica. The piriformis is a muscle that lies directly over the sciatic nerve. If this muscle becomes tight or if you have a spasm in this muscle, it puts pressure directly on the sciatic nerve. Occasionally, sciatic pain in men is caused by sitting on a wallet. 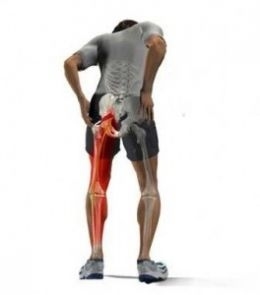 The vast majority of the time, when sciatic pain is caused by muscular spasm the pain can be relieved through a combination of stretches, deep tissue massage of the piriformis muscle. Chiropractic adjustments help calm the spastic muscles. If the cause is due to disc herniation a technique Dr. Peck uses called "Cox Flexion Distraction" (a form of spinal decompression) works well. Spinal Adjustments also help relieve the pressure on the pinched sciatic nerve. The best approach for this type of pain is chiropractic care. Although medicine can be used for the pain, it does nothing to correct the cause of the problem. This can only be achieved through chiropractic care or surgery. Surgery is always the last option. The goal of both is to take pressure off the nerve. An alternative to medicine is acupuncture for pain relief.